This page is about the town called Jupiter. For Jupiter Island in Martin County, see Jupiter Island, Florida. 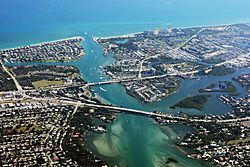 Jupiter is the northernmost town in Palm Beach County, Florida, United States. According to the 2015 Census Bureau estimate, the town had a total population of 62,707. It is one of the northernmost communities of the Miami metropolitan area, which was home to an estimated 6,012,331 people at the 2015 census. It was rated as the 9th Happiest Seaside Town in America by Coastal Living in 2012. The most notable landmark is the Jupiter Inlet Lighthouse, completed in 1860. Made of brick, it was painted red in 1910 to cover discoloration caused by humidity. Hurricane Jeanne in 2004 sandblasted the paint from the upper portion of the tower, and the tower was repainted using a potassium silicate mineral coating. The lighthouse is often used as the symbol for Jupiter. According to the United States Census Bureau, the town has a total area of 21.1 square miles (55 km2), of which 20.0 square miles (52 km2) is land and 1.1 square miles (2.8 km2) is water. Jupiter has a Tropical savanna climate. Much of the year is warm to hot in Jupiter, and frost is very rare. As is typical in Florida, there are two basic seasons in Jupiter, a mild and dry winter (November through April), and a hot and wet summer (May through October). Daily thundershowers are common in the hot season, though they are brief. The city of Jupiter is home to many tropical and subtropical plants and trees, and the city is known for its lush landscaping around private homes and public parks. In 2000, the town the population is spread out with 20.7% under the age of 18, 5.1% from 18 to 24, 28.8% from 25 to 44, 26.5% from 45 to 64, and 18.9% who are 65 years of age or older. The median age is 42 years. For every 100 females there are 97.2 males. For every 100 females age 18 and over, there are 94.2 males. In 2000, the median income for a household in the town is $54,945, and the median income for a family is $64,873. Males have a median income of $44,883 versus $33,514 for females. The per capita income for the town is $35,088. 4.8% of the population and 3.0% of families are below the poverty line. Out of the total population, 4.7% of those under the age of 18 and 4.7% of those 65 and older are living below the poverty line. As of 2000, those who spoke only English at home accounted for 88.5% of all residents, while those who reported speaking Spanish were 7.2%, and Italian 1.7% of the population. Jupiter is the home to the Miami Marlins and St. Louis Cardinals spring training facilities as well as one of their respective Class A Minor League Baseball affiliates, the Jupiter Hammerheads and Palm Beach Cardinals. They share the use of the Roger Dean Stadium complex, located in Abacoa. Both minor league squads compete in the Florida State League. William P. Gwinn Airport is located in Jupiter. Palm Beach International Raceway a racing facility built in 1965, and was remodeled in 2008 in an attempt to obtain a FIA Grade II Certification. The Facility currently host several IHRA and NHRA sportsman events as well as an ARCA Remax Series Event. The Scripps Research Institute has opened a satellite campus adjacent to the MacArthur Campus of Florida Atlantic University in Jupiter. Approximately 360 scientists and technical staff operate in a 350,000-square-foot (33,000 m2) state of the art research facility. Scripps Florida focuses on the development of therapeutic opportunities in several disease areas. The Max Planck Society has also opened a facility on the FAU campus, the Max Planck Florida Institute for Neuroscience, and is the Max Planck Society's first non-European research institute. Jupiter beaches are what draws many residents and visitors many of which are dog friendly. Busch Wildlife Sanctuary, a non-profit, educational based care facility for injured wild animals. The television program American Horror Story: Freak Show was set in Jupiter. In 1999, Jupiter resident George Andres wanted to display a United States flag in his front yard, however, the homeowners association had a bylaw prohibiting the display of a flagpole in the front lawn. Andres still displayed the flag, while the homeowners association went as far as foreclosing his home to cover legal fees after being in court at least twenty-eight times. Even after governor Jeb Bush visited his home along with members of the local and national media, the homeowners association refused to budge. Andres said, "Well, first they said that it was going to cost more to cut the grass around the pole, which is kind of funny. And then they told me that the flagpole was going to take away from the value of the property. And I said, well, then we should be able to take away all the trees around here, because they're the same as the pole. And my pole is a portable pole. And the state government says I can do it." George Andres won and was allowed to display his flag in his front lawn with the use of a flagpole. During the last week of July 2006, President George W. Bush signed the Freedom to Display the American Flag Act of 2005, allowing residents to display the flag on their residential property despite any homeowners association rules. 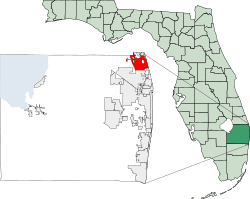 Jupiter, Florida Facts for Kids. Kiddle Encyclopedia.